Forest soils are the foundation of the entire forest ecosystem and complex, long-term interactions between trees, soil animals, and the microbial community shape soils in was that are very distinct from agricultural soils. The composition, structure, and processes in forest soils at any given time reflect current conditions, as well as the legacies of decades (and even millennia) of interactions that shape each forest soil. Reciprocal interactions are fundamental; vegetation alters soil physical properties, which influence soil biology and chemistry, which in turn influence the growth and success of plants. These dynamic systems may be strongly influenced by intentional and unintentional management, ranging from fire to fertilization. Sustaining the long-term fertility of forest soils depends on insights about a diverse array of soil features and changes over space and time. Since the third edition of this successful book many new interests in forest soils and their management have arisen, including the role of forest soils in sequestering carbon, and how management influences rates of carbon accumulation. This edition also expands the consideration of how soils are sampled and characterized, and how tree species differ in their influence on soil development. 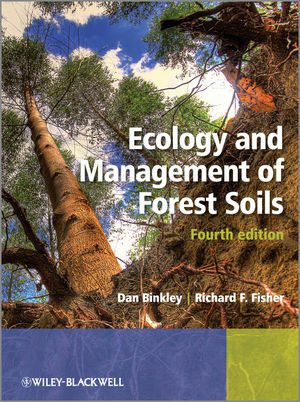 This coherent overview of the major issues surrounding the ecology and management of forest soils will be particularly useful to students taking courses in soil science, forestry, agronomy, ecology, natural resource management, environmental management and conservation, as well as professionals in forestry dealing with the productivity of forests and functioning of watersheds.